BASF's Paul Czornij predicts blue to take over white and other neutrals as the most popular colour among car buyers. Editor's note: BASF's coatings arm generated global sales of $3.2 billion last year. The figure was incorrect in earlier versions of this story. DETROIT -- Deep and non-saturated blues emerged as top car hues in automotive paint supplier BASF Coatings' annual colour trends report, a 65-colour recommendation for automakers. Those concept colours, which could appear on vehicles in the next four to five years, reflect societal changes such as young people migrating to cities, a digital era and a person's need to connect with nature. 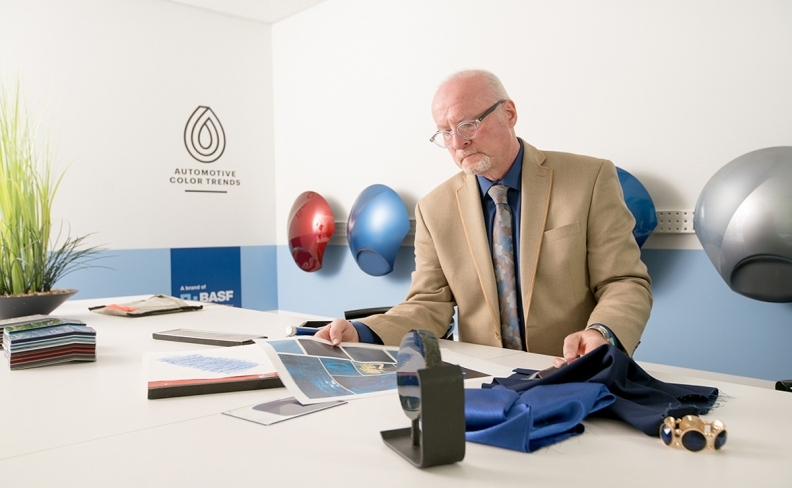 "Blue continues to gain strength as an automotive colour," Paul Czornij, head of design for automotive paint supplier BASF's Color Excellence Group, said. "It has a calming effect and a strong correlation with natural things." Czornij expects the colour to take over white and other neutrals as the most popular colour among car buyers. The effects of technology on a person's mood, which then impacts expression, also inspired this year's colour compilation, according to Czornij. "The expressive part of the car, which is on the outside, is the projection of who you are to the rest of the world," Czornij said. The idea of digitalization led Czornij's team to create their key colour, a dark navy blue shade called "Undercurrent Blue." Other top North American colours in this year's report include "Cabochon," a mild turquoise blue, and "Abyss" a metallic variation of black. The three shades are examples of "Translucid," the overall theme of the report, which describes a desire for more simplicity and transparency in a digital world. The colours won't be spotted on cars immediately, Czornij said, they'll be presented to automakers in the United States who can then decide which ones they want to incorporate. Color preference varies through the years. Green cars were popular for a large chunk of the 1990's while neutral colors such as white and silver have reigned during the past decade -- thanks to indications of a more technically advanced era, Czornij said. Automakers such as Tesla Inc. are already adopting the new trend. According to MarketWatch, they debuted three new colors last year -- a glossy black, a dark silver and a deep blue -- after determining those hues were the most popular among their buyers. "We assess what might be affecting moods and that tells us how a consumer is going to relate to the color on automotive car body," Czornij said. BASF Coatings, a division within the chemical and plastics supplier, develops automotive coatings, refinishes and decorative paints for automakers around the globe, such as General Motors, Tesla and Mercedes-Benz. The coatings arm generated global sales of $3.2 billion last year, a small bite of the parent company's $64.4 billion in global sales. BASF also supplies a variety of plastics, chemicals, brake fluids and other materials to the auto industry. BASF, based in Ludwigshafen, Germany, ranks No. 19 on the Automotive News list of top 100 global suppliers, with worldwide sales to automakers of $10.6 billion in its 2015 fiscal year. The 2017 list will be published on June 26.